We are only a few hours away from the commencement of the FIFA World Cup 2018 in Russia. The whole of Russia is eagerly and patiently waiting for the tournament to begin with the first match of the tournament being between hosts Russia and underdogs Saudi Arabia. 32 teams will be competing to see who is the greatest of them all. So far, 836 matches have been played in the history of the FIFA World Cup and 2379 goals have been scored. Out of these 836 matches, there have been a number of matches which have aged very well and have gone on to be regarded among the finest World Cup matches. Let's take a look at the top five World Cup matches of all-time. Ahead of the 2002 World Cup, not much was expected from Germany and Brazil. However, both teams played some dazzling football throughout the tournament and were in the final. While Ronaldo was piling up goals throughout the tournament, Oliver Kahn was producing one save after another. Germany had Miroslav Klose who was one lethal young striker but were without star attacking midfielder Michael Ballack who was suspended in the semi-final against South Korea after scoring what would go on to be the winning goal. Brazil had the likes of Rivaldo, Ronaldinho, Cafu and Roberto Carlos in addition to Ronaldo. The match was expected to be a thrilling one and the battle everyone was eager for was "Ronaldo vs Kahn". Oliver Kahn conceded only one goal coming into the final. The match was held at Yokohama and a crowd of close to 70000 had come to see the final. Brazil got a good scoring chance in the 19th minute when Ronaldo was played by Ronaldinho only for the former to hit his shot wide of the target. In the half-hour mark, Ronaldo had another good chance but this time he was pressured by centre-back Thomas Linke and could not get much power on his shot which was eventually saved by Kahn. During the final minutes of the first half, Kleberson hit the bar. During injury-time, a Roberto Carlos pass found Ronaldo but Oliver Kahn saved it by outstretching his foot. The beginning of the second half saw Germany getting some scoring chances for a change. Jens Jeremies tried to score from a corner in the 46th minute but his header was blocked by Edmilson. In the 50th minute, Oliver Neuville struck a brilliant free-kick but Brazil goalkeeper Marcos got his hands on the ball and it hit the post instead. 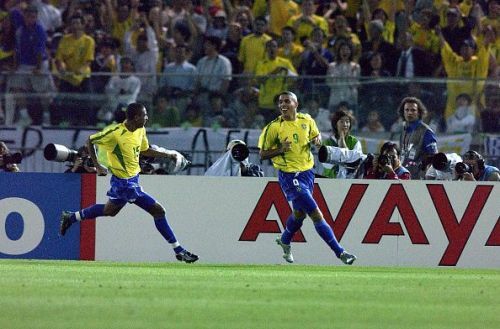 In the 67th minute, Ronaldo won possession of the ball from Dietmar Hamann and passed towards Rivaldo. Rivaldo took a shot which was only blocked by Oliver Kahn. Ronaldo then scored from the rebound to give Brazil the lead. Brazil kept on attacking but the Germans were resilient. However, resilience wasn't enough for Germany. They even brought on Oliver Bierhoff who scored the golden goal of Euro 1996 but they weren't able to get the equaliser. With 11 minutes to go, a run from Kleberson baffled the German defenders. Kleberson's pass went towards Rivaldo who allowed the ball to pass through his legs towards the unmarked Ronaldo. Gerald Asamoah came in to pressure Ronaldo but the latter used his first touch to get the ball away from Asamoah before finding the bottom corner of the net to double Brazil's lead. Germany tried to keep their hopes alive and nearly scored one in the 83rd minute but Marcos saved Oliver Bierhoff's powerful shot from close range. The match ended with Brazil winning their 5th World Cup while Germany lost their 4th World Cup final.